Agricultural Education prepares students for successful careers and a lifetime of informed choices in the global agriculture, food, fiber and natural resources systems. TEA recognizes the high school agriculture science program as a part of a 3-ring intra-curricular program for students. 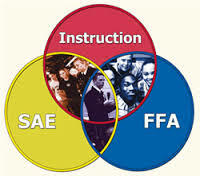 Instruction, Supervised Agriculture Experiences and the FFA are all intra-curricular parts of the 3 part model used in Agriculture Science Programs. Agriculture Science Class at BH ISD include: Dual credit horticulture, DC wildlife, Dual credit Animal Science, Ag Mechanics, Ag Power (tractor mechanics), Meats Lab Processing, Wildlife Management, Animal Science and much more.